Are you looking for new decorations and accessories to embellish the look of your living room, office room or bedroom? We’ve gathered a selection of amazing pieces of decoration that will certainly improve the look of your desired room. From brand new and comfortable office chairs to wall decors and good keyboards available for sale, there is certainly something to satisfy your taste as well. And, if you still didn’t find what you were looking for, just make sure to search for similar items from the same brands. Whether you’re a teacher or a math enthusiast, this wall clock is perfect for stimulating your mind early in the morning. The hands of this watch move around the dial indicating the exact time of the day through a series of different math equations and problems. This unique and creative way of keeping track of time goes perfectly in classrooms or in your own office, and could easily become one of the most popular and thoughtful gifts for watch lovers with a sense of humor. The item is made of matte black powder-coated metal and features white numbers and letters for maximum contrast and an easy reading. 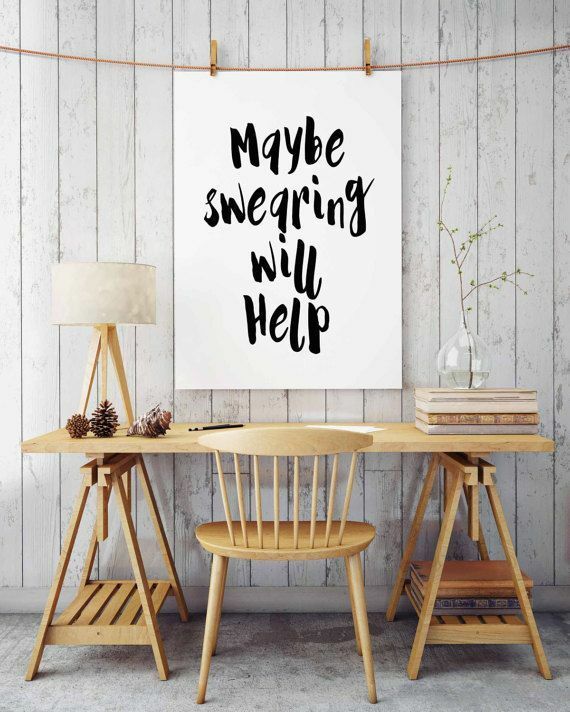 Looking for new inspirational quotes to hang on your walls? Why not take the advice of famous basketball player Michael Jordan and read some of his words of wisdom? This motivational board features high-quality printed quotes from the basketball player and can represent a thoughtful gift or a cool addition to your office walls or bedroom. The 12×24 inches print is large enough to allow to easily read what’s written from a considerable distance so that you can be empowered from any corner of the room. You can order the item already framed or you can add the favorite one yourself. This product is available in four different colors, so make sure to choose the one that best matches the rest of your room decor and furniture. It’s made of real and natural wood and comes in two different parts that need to be assembled. Both the position and the distance between two parts can be adjusted according to your needs and requirements, so you’ll end up with a multifunctional and useful desk organizer. You can use it to stack your favorite books, small files, and other small desk objects so you’ll get a cleaner working space in just a few minutes. This set contains 12 assorted species of live Tillandsias, which are great decorative air plants. You can use them to create wonderful terrariums and other green decorations that will certainly change the look of your room. The pack also features a spray bottle mister that’s perfect for water and fertilizer so you’ll easily look after the plants. Each plant is mature and measures between 4 and 10 inches. All plants are extremely easy to look after and you won’t need soil to plant them. All you have to do is water them once in a while and place them in lighted rooms, without directly exposing them to the sun heat. This 17-inch ship decoration is available in no less than 14 color combinations, so you can choose your favorite one or buy more for a complete nautical decor. It’s perfect for sea-inspired resorts, beach houses, and Mediterranean decors, but will also look great in offices or your living room. The clean lines and simple colors are easy to match with numerous other types of room decors and furniture pieces. The item is made of solid wood and features hand-stitched real sails that are professionally painted to provide a realistic design. It’s a great gift for people of all ages and will work great for summer themed parties. This cool floor lamp is made of high-quality wood for the base and paper for the superior part. It’s the perfect item to replicate a natural decor and will look great in all types of rooms, including office rooms, bedrooms, and living rooms. The collapsible natural paper allows you to easily transport and mount the product wherever you want. It’s also easy to store and won’t occupy too much space in your closet or basement. The product works with three 60W incandescent light bulbs and will provide a dim and romantic light, perfect for reading or relaxing. If you’re looking for a more antique form of measuring time, why not choose a real hourglass? This particular item is made of a premium-grade metal alloy that won’t rust or change its colors in time, and glass. The clean and clear lines provide an elegant and natural design to the product so you can easily integrate it with many other types of decorations. It goes perfectly with sea-inspired decors as well as with pieces of furniture made of recycled or distressed wood. The hourglass was specifically designed to measure one-quarter of an hour. The product works great as a relaxation instrument for your mind and eyes, helping reduce anxiety and stress. This unique arch floor lamp will certainly brighten any room and will provide enough light for you to read or have a quiet family dinner. The item is available in many designs, so make sure to opt for the product that will best meet the requirements of your room decor. The 5-arm adjustable lamp measures approximately 84 inches in height and features a beautiful marble round base for added stability and elegance. The item is delivered with halogen light bulbs and snowbell-shaped glass shades. It’s easy to install and will help you achieve a unique design for your living room or office. This beautiful world globe-shaped lamp is the perfect present for gentlemen. It’s delivered in an elegant gift box so you won’t have to spend additional time wrapping it. The sturdy stainless steel base offers increased stability and touch of masculinity to the clean and clear lines of the globe. It can be easily plugged in via a regular included mini USB cable and is also delivered with a 25W light bulb. The globe offers a warm and diffuse yellow light, perfect for bedrooms and relaxation rooms. It can help you plan your future trip and explore new areas of the world. This product is delivered in two different heights and represents a unique green decor that looks extremely real but it’s a lot easier to take care of than a real plant. The braided money tree is made of top-quality materials and will never fall apart, meaning you can enjoy a year-round green decor anywhere you are. It’s perfect for both indoor and outdoor use and will make a great addition to gardens, kitchens, patios, swimming pool areas or even office rooms. It comes with a total of 370 shiny green leaves that will maintain their original colors even after exposing the plant to direct sunlight, wind, rain or dust. Time efficient and finding the best office decorations are not two ideas that go hand in hand. There are a lot of diverse types of objects, and it can be hard to decide on just a single one. And trying to discover one that fits your tastes and persona, can be very resources and time-consuming. If you find yourself on the lookout for the ideal models to suit your aesthetics or if you’re considering them as possible gifts, then there are a few aspects worth researching. Like what do you need a decoration for? There are ones that can help you be organized or ones that can give a comfortable zen atmosphere to your cubicle, making you more productive. And of course, you need to make sure your office rules are not overstepped when buying such a product. You should ask your boss if it’s ok to personalize your desk however you want. With the right ornament, you can transform a dull office space into one that is more friendly and welcoming to everyone. There isn’t just one type of office decoration for sale. There are quite a few categories for you to choose from, that fulfill different purposes. You might want one that can have multiple utilities such a pencil holder, that can bring a touch of color to your desk, and help you stay organized. Or a folder organizer can pretty much have the same purpose, allowing you to declutter a bit and have more breathing space. This will help with productivity and will make you more eager to work. The right accessory can help you impress your colleagues and superiors with how happy you are to do your job. It is all about knowing who you are and what you need and what product can help you become an improved version of yourself. A proper decoration shouldn’t have just one duty to fulfill. Of course, it should make your working area seem more enjoyable and bring a spot of color in that sea of greyness most offices come in. But it should also help you develop skills you might need to be the best at your job. They should allow you to make the most of use of such products. It is essential that your office decoration help you not misplace your things and to give you quick solutions to what you’re looking for, no matter if we’re discussing about files, pens or sticky notes. This will give you the chance to save time, not always having to look for your misplaced documents. We think the right accessory can help you stop procrastinating, by allowing you enjoy your work a little bit more and by being fun to use – that will make you want to use these cheap office decorations all the time. If you are going to use these office decorations at your own personal office at home, then feel free to chose any color or style you want. You are in charge of everything so you should aim to please only yourself and there are great home decorations for you. But if you’re going to use them at work, then maybe it’s a good idea to double-check the official rules. Most offices have neutral color schemes that make going to work a chore because they lack life and personality. So it might be a beneficial idea to choose a model that is a bit more colorful and that maybe has a neat pattern. It can bring a smile to your face everytime you’re looking at it, making you do your job better. But be careful not to choose something very shiny or that it comes in bright colors, as it might distract you from your task. A carefully selected product can help you advance in your career faster than you might think, mainly because it can give you such a relaxed state of mind. A well-made product can be your companion for a long time. So pay a few extra minutes researching what your next buy is made of, just to ensure you have a sturdy object on which you can always count on. A premium-looking model could become the focal point of your desk and can impress everyone around you, the reviews of office decorations state. If it is constructed to look durable, you know you can use that decoration every day, and it won’t break. That won’t be on the list of your worries and this way you can channel your attention to things that matter. The high-quality materials will for sure make your colleagues stop and ask you where you got the model from. Another consideration is that in a chaotic office, a sturdy item will have a prolonged lifespan since it can survive being accidentally kicked off your desk, or even stepped on by clumsy people. The build quality needs to be exceptional because this way people will associate its value with the one of your office, bringing it a good reputation. An excellent looking piece of decoration can be a formidable conversation starter. So if you are new to an office, a unique product may help you break the ice and give you a great topic to discuss. In a way, decorations can connect people especially if they have well-made designs and if they are eye-catching. A useful model or one that is stylish can transform a depressing and dull cubicle, into one that is truly personal and that has the footprint of your tastes. You can identify with your workspace through them, making you waste less time and have more results. They can be inspirational pieces, especially if they don’t break any etiquette rules your job may have in place. And if you have more than one of these premium items, it can make visitors feel welcomed and like they are part of a high-class experience, thus investing more time and money in your business.